Responding to the chemical attack in Douma, Syria, that killed over forty civilians, Labour’s Shadow Foreign Secretary Emily Thornberry has called for “an urgent independent investigation” and said that “once this investigation is complete” those responsible must be held to account. Emily Thornberry took the same approach last year after the April 2017 Khan Sheikhoun sarin nerve agent attack that killed over seventy Syrian civilians including tens of children. Then she criticised the US military response and called for a UN investigation leading to international action. Russia responded by blocking the joint investigation with its Security Council veto. As for Emily Thornberry, far from calling for any action against Assad after the UN-OPCW investigation’s guilty verdict, she instead stood up in the House of Commons in December and suggested Assad be left in place and the regime be granted international funding for reconstruction. 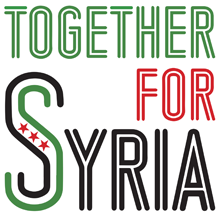 We and other SyriaUK activists recently gatecrashed a fundraising dinner hosted by the Shadow Foreign Secretary in her Islington South constituency. We distributed a special menu to diners setting out some of Emily Thornberry’s recent unsavoury offerings on Syria, and calling for an alternative policy menu focused on protecting civilians. In order to glide among diners without causing undue alarm or hostility, we posed as waiters. Our title was “Don’t give Assad Syria on a plate,” because of Emily Thornberry’s worrying remarks in Parliament in December when she floated a proposal to keep Assad in power. Along with the Labour Campaign for International Development, we wrote a joint letter to the Shadow Foreign Secretary making clear our objections, only to receive a rude reply where Emily Thornberry denied responsibility for her own words. In Emily Thornberry’s scenario, she suggested that international assistance—in other words UK taxpayers’ money—could help pick up the bill for reconstruction of the towns and cities bombed by Assad and Putin, while leaving Assad still in power. Assad’s regime in Syria is based as much on economic exploitation as political repression. Assad family members and cronies control major parts of the economy in regime-held Syria, and already profit from Damascus-based UN aid operations which are unable to operate independently of the regime’s mafia-like control. 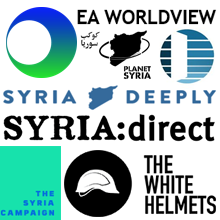 Investing in regime-held Syria would not only be rewarding the perpetrators of the worst set of atrocities this century, it would further entrench the corruption and exploitation that was a primary driver of the first 2011 protests against Assad’s regime. The UN Commission of Inquiry into Syria in a recent report said that reconstruction aid should depend on the release of detainees, on criminal accountability for perpetrators of torture and killing, and on truth and justice for the survivors and the families of victims. In Syria, that world order governed by rules is being destroyed daily by Assad and Putin’s flouting of all UN resolutions passed since 2013: resolutions banning use of chemical weapons, demanding an end to bombardment of populated areas, demanding an end to sieges against civilians, authorising unrestricted humanitarian access by UN agencies. Today the entire credibility of UN authority, UN structures, UN agencies, as well as the very concept of international humanitarian law, is at stake. Will Emily Thornberry now show the same resolve now as Robin Cook did then? Will she reject appeasement of Putin, and stand up for the enforcement of international law for the security of all, and for international protection to allow Syrians to live in their homes in peace? Labour’s own credibility is also at stake, with Jeremy Corbyn’s stance on Syria receiving the endorsement of former BNP leader Nick Griffin. Some may be confused when the Labour leader condemns violence ‘on all sides’ without blaming Assad in particular. Nick Griffin, a long-time supporter of Assad, clearly believes he understands Corbyn very well. We are now at a decision point. After this latest chemical weapons outrage, with the Assad regime’s responsibility for previous attacks already established by the UN and the OPCW, will Labour MPs now show that Labour is capable of supporting action to punish the guilty and protect the innocent? "...with the Assad regime’s responsibility for previous attacks already established by the UN and the OPCW..."
That is fantasy and you know it. US Defense Secretary Mattis himself admitted that there is no proof of Syrian government responsibility. Lying only discredits the rest of your work. You are mistaken. If you check the relevant transcript of Mattis’s remarks you will see he has been misrepresented. Would that be the same OPCW that certified the destruction of Syria's chemical weapons stockpile in 2013, as part of a UN-mediated process?